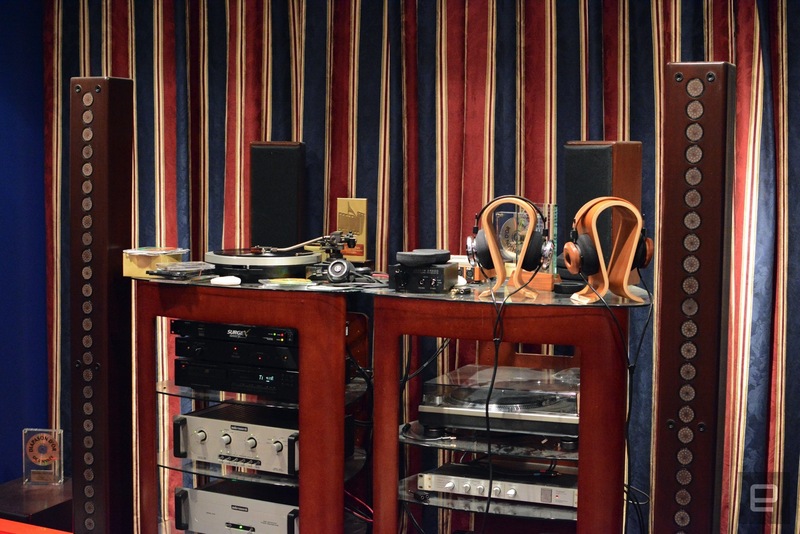 A Brooklyn family and their decade-spanning audio workshop. Grado Labs is a special place. That sounds hyperbolic, but allow me to explain. Behind a graffiti-covered Brooklyn facade, there's a small factory where the family's namesake headphones and turntable cartridges are assembled. When you step inside the door off of Seventh Avenue into what used to be the family's fruit market and home, a history lesson awaits. And it's not just about this particular company, but of the audio industry as a whole. It just happens to be told through the lens of one New York City family. Unless you're really into headphones, it can be easy to overlook Grado Labs. The likes of Bang & Olufsen, Bose and Sony crank out new models every year -- sometimes multiple new headphone options in a 12-month span. As I would discover, Grado's smaller stature has its advantages when it comes to working with new materials and dialing in a new product. Things aren't released until they're ready, and sometimes that can mean years between products. The company's last flagship headphone was introduced around 10 years ago. Of course, a small workshop-like outfit in Brooklyn doesn't pop up on your radar unless you're paying close attention -- the company hasn't advertised since 1964. After spending a day with the Grado family, I now understand why they don't need to. The company began in 1950 when Joseph Grado, a watchmaker at Tiffany, started making phono cartridges for turntables in his kitchen. Within three years, production exceeded what Grado could reasonably make at home, so the business expanded into the building that housed the family's fruit store around the corner. In 1965, Joseph's nephew, John, began working there. His first job? Sweeping the floors, of course. "I started working here as a 12-year-old," John remembers. "I came on full-time after college in 1975. I was kind of thrown in -- my uncle moved out in 1978 and he threw me into running the place." He must like it -- he's been there for over 50 years. 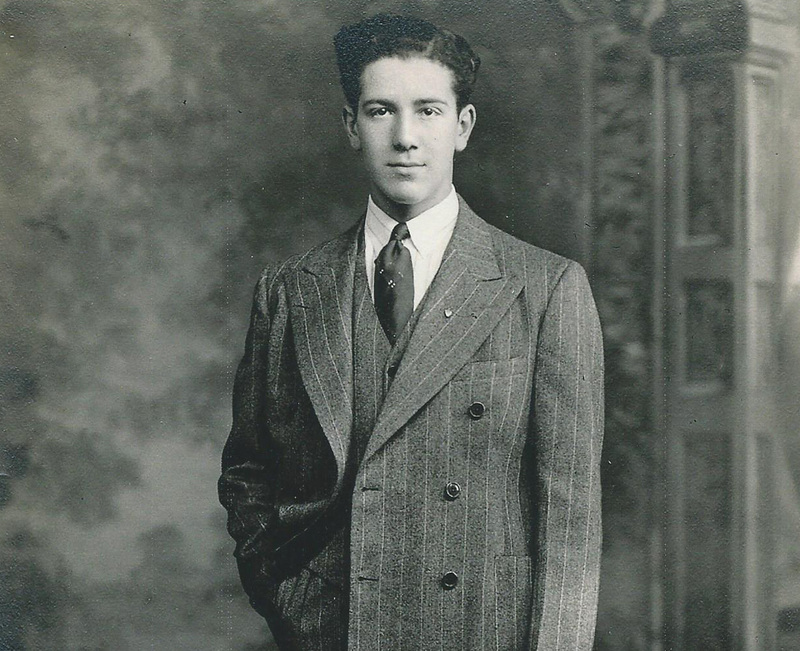 John Grado bought the company from his uncle in 1990; since then, he has been the president and CEO. John explains that after the introduction of the compact disc in the 1980s, the hype around turntables started to decline. The company wasn't selling as many phono cartridges, its sole focus since 1964. "We knew that if we wanted to continue to exist, we had to get into something else," he explains. "We decided on headphones." In 1990, John built and released the company's first line of headphones. By 2014, Grado had more than 60 models, and today, the headphone line is still growing. "Those first three or four years, we were just barely getting by," John says about starting in the headphone business. "No money was being made." John and his wife, Loretta, lived on the top floor of the same building where the company still makes headphones, phono cartridges and headphone amps today. 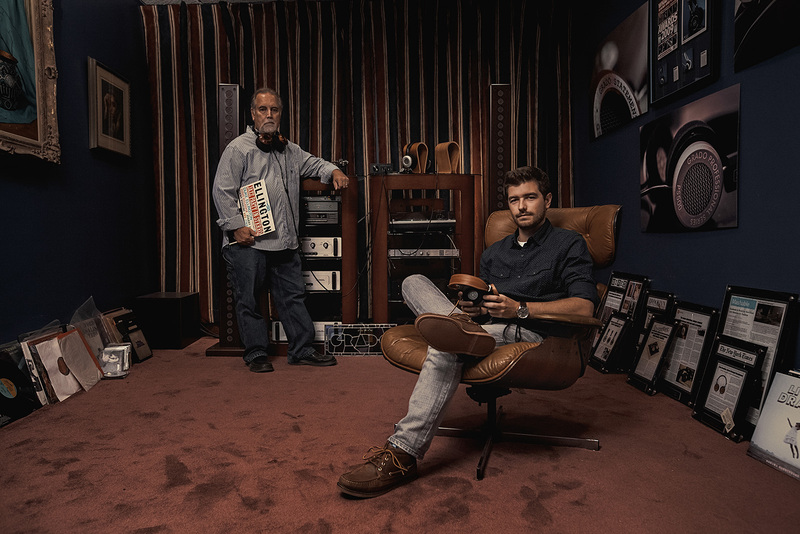 When Grado Labs began making headphones, the couple would sit at a workbench and make new pairs every day. Some of the same equipment Joseph operated in the early days of the company is still used for very specific tasks in both cartridge and headphone production. Walking through that basement feels like you're walking through a time capsule. And I mean that in the very best way possible. 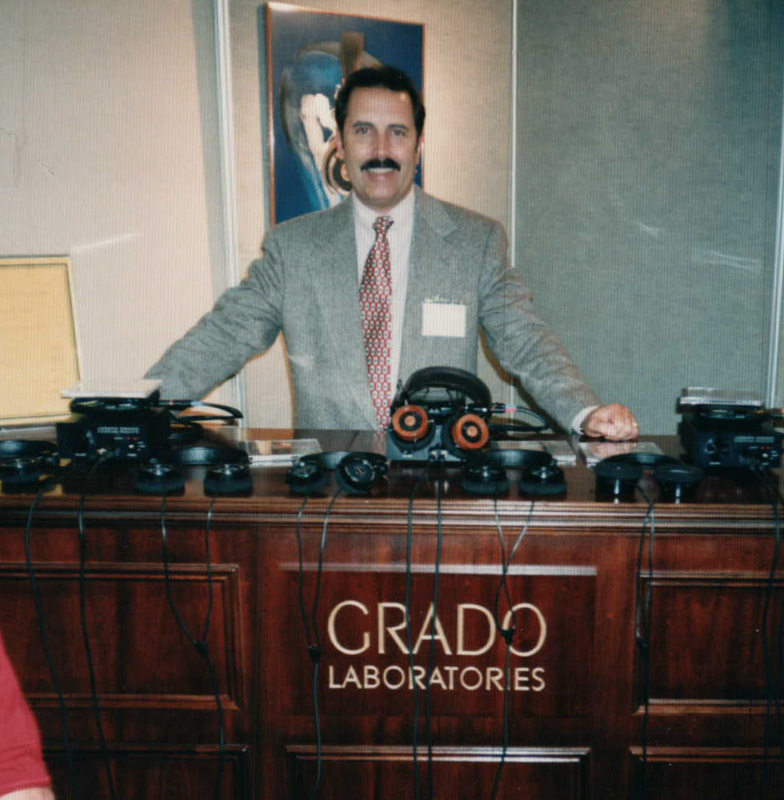 John Grado at the company's booth in 1995. John admits he had bigger plans than headphones when he took over in the early '90s, but the success of the $69 SR60 model in persuaded him to shelve ideas for a line of speakers and other audio gear. In fact, the new speakers were almost ready for production when the focus shifted primarily to headphones. A pair of the massive wooden towers sit in the listening room at Grado Labs today, prototypes of what the final versions may have looked like. "That headphone really put us on the map -- it took off like a rocket," he says. "I also wanted to do speaker systems and electronics. I had just about finished the speaker designs when the SR60 headphone came out. When it took off, I made an executive decision, and we just stuck to the headphones." The company is known for making its products out of wood. In 1994, John created what would eventually become the first wooden Grado headphones: the RS1. It wouldn't limit the use of wood to its headphones, though. In 1996, the company introduced its first wooden phono cartridge and its first headphone amp built from a single block. "We do most of the work here," John explains. In the beginning, the company made about 25 pairs of wooden at a time there. Several models are made out of wood or feature it in some way, so it would require a massive investment to keep everything right there in Brooklyn now that Grado has increased production. John turned to a friend to do the woodwork and manufacture some metal parts at a facility in upstate New York. He enlisted another friend on Long Island to produce the headphone speakers. What exactly is still done in Brooklyn? All of the injection molding of plastic parts for both headphones and phono cartridges takes place in the basement. There are also machines that punch metal covers for cartridges and make parts of the headphone assembly. A number of the machines have been there for decades doing the same specific jobs. 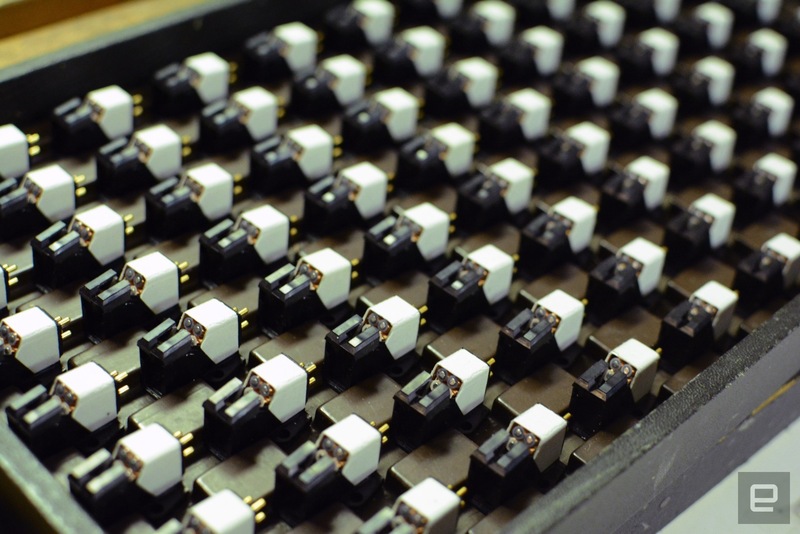 One floor up, the phono cartridges are assembled in a room next to the company's office. All of the coils for those components are wound in-house, and that area of Grado is not unlike the back of a jewelry shop. A dozen or so employees do the very detailed work of assembling turntable cartridges with tiny tools and parts; the areas where these pieces are assembled are very similar to a jeweler's or watchmaker's bench. Headphone production, where all the parts are put together, is on another floor. One employee who walked me through the assembly of a pair of SR60e headphones has been there since 1994. If you own a pair of Grados, there's a good chance she constructed them. John Grado runs down the list of what makes his company special. In addition to being a family-owned world-class audio-gear business, the company is able to do one-off versions of its headphones for special occasions -- something most bigger mass-produced brands can't accommodate. 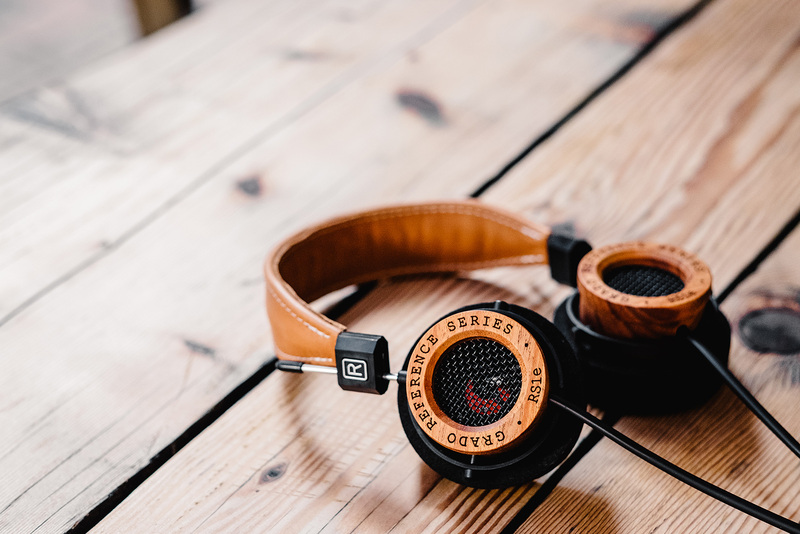 We're talking a single pair for Billy Joel; a small run made of wood from a General Mills yogurt mill; two pairs of white-oak cans for E&J brandy; and limited-edition headphones from a tree just down the street in Brooklyn. "There have been a number of things that like over the years," John explains. "It makes it fun for us." 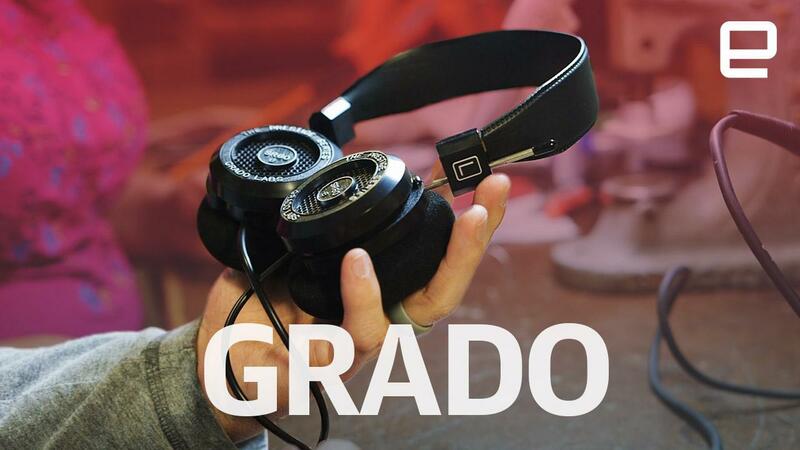 Grado prides itself on building headphones for every price point without sacrificing sound quality. The entry-level SR60e retails for $79 (an even-more-affordable $49 eGrado wraparound style on-ear set uses the same drivers as the SR60). Higher-end units sell for well over $1,000. The company just announced its latest flagship model, the PS2000e, this week; at a retail price of $2,695, those will sit at the very high-end of the Grado line. When asked which model would be the best introduction for someone unfamiliar with Grado's products, John doesn't hesitate. "I always start with the SR60," he says. "A lot of people shy away from it because of the price, when some of the competition starts at $200 to $400. They listen, and they're amazed at what you can get for $79." He's right. having only been exposed to some of the higher-end Grado gear, I admit wasn't expecting much from a pair of sub-$80 headphones. I was blown away by the clarity and natural tuning. In 2002, what once was the family living room became the place where the sound for all Grado products would be designed. Rows of vinyl are stacked neatly on the floor, ranging from blues and jazz like Clapton and Duke Ellington to newer artists like J Dilla and Jack White. John points out that the newer stuff belongs to his son, Jonathan. "I grew up in this room," Jonathan tells me as he and his father explain what happens in the listening room. A number of companies have heard about this room and the system to dial-in new products; they all want to send him their gear to install. "If I do, I lose my reference point," he explains. "This is a higher-end system, but it's closer to what a lot of people would have at home. That's who we're building for." Grado Labs won't be leaving the family any time soon. Jonathan returned home after a post-college stint with Sonos, and he's now Grado's vice president of marketing. It's 2017, so you can't talk about headphones without mentioning wireless. We consume most of our music digitally via streaming services and on our phones. Heck, some companies have ditched the headphone jack entirely. So, I had to ask. John makes the comparison to closed-back headphones. "Wireless technology has never been very good, so just like closed-back, we could make them, but people would expect them to sound like our wired headphones," he says. "And they won't." It's not all bad news if you're a huge fan of wireless headphones, though. "We're going to get into wireless," he says. "We're working on it, so it's not out of the question. We were waiting on the technology to catch up." But he's still a wired purist. "I still don't think it will sound as good as the wired stuff," he says. "But we feel the technology has gotten to the point where we feel it would be worth it for us to start getting our feet wet." The resurgence of vinyl has been documented in detail. As you might expect, that means great things for a company that once relied solely on phono cartridges to drive its business. He never imagined turntables would make such a comeback. "We never expected to still be making them in 2017," John says.